Former Australian YCW and International YCW leader Bill Armstrong has been deeply immersed in Australian volunteering through all these passing generations, writes Robin Davies at DevPolicy. He is best known as head of the Melbourne-based non-government organisation Australian Volunteers International, which until 1999 had been known as the Overseas Service Bureau, for two decades until his retirement in 2002. But he goes back much further than that, having joined the fledgling Overseas Service Bureau as a junior staff member in the early 1960s, around the time it absorbed the Volunteer Graduate Scheme. Unsurprisingly, Bill has encountered sceptics in the course of his career, people who think that volunteering is a kind of amateur activity without much impact, or at least lasting impact. ‘There are lots of people who somehow can’t get out from under the fact that if you don’t earn big money you’re not really professional, or there’s something wrong with you—you’re a “missionary, mercenary or misfit”. Bill well recalls the period when Papua New Guinea was heavily dependent on the substantial numbers of Australian volunteers who worked as doctors, nurses, teachers and engineers throughout the country. He points to OSB’s early project in Vietnam, which trained or upgraded about 1,000 Vietnamese English-language teachers before the Australian government was ready to go back in with its own aid program. He points to the contributions of Australian and other volunteers in refugee camps in Africa and other parts of the world. And he talks also about the particular importance of volunteers in small and fragile states. 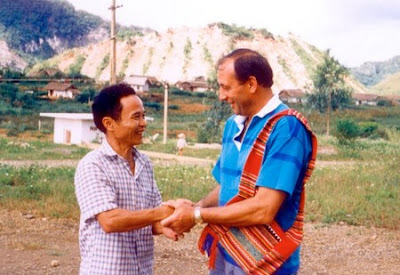 Bill owes his own introduction to international development, and indeed a good deal of his education, to the Young Christian Worker’s Movement, a Catholic youth organisation with which he became involved as a 16-year-old apprentice. In time, it was deemed to be too progressive an organisation, and lost the support of the church. Its equivalent would be hard to find now, concludes Robin Davies.